Voters are giving New York Gov. Andrew Cuomo and Senate Minority Leader Chuck Schumer their lowest ratings ever in the latest Siena College poll. But they're not alone, according to pollster Steve Greenberg, who says those polled have lowered their favorability ratings for virtually all statewide officials. ``For Governor Cuomo, Sen. Schumer, Sen Gillibrand, to both the Assembly and the Senate. But what we also see is voters like what Albany did in January," he said. Greenberg says voters think many of the new measures that have passed, including the Child Victims Act, GENDA, some of the new gun control laws and the Dream Act will help move the state forward. Despite support for those new laws, Greenberg says voters just don't feel as good about some of their elected officials. 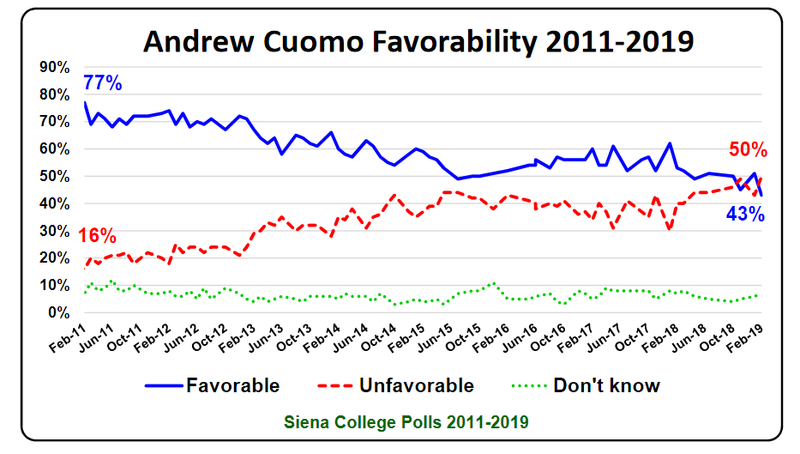 And Cuomo’s favorability rating took quite a tumble compared to a month ago. ``The fall from where he was last month when he had a 51 to 43 favorability rating to today where he's underwater. 43 percent favorable, 50 percent unfavorable. The drop was among Democrats, Republicans and Independents," he said. Greenberg says the drop in favorability ratings may be due to the polarization in Washington. And in Albany, while Democrats like the fact their party is in control of state government, Republicans are very angry and upset about that, and don't think it's good for New York. “Siena doesn’t always get it right and, color us skeptical, but for the governor, Senator Schumer, Senator Gillibrand, the state senate and the state assembly to all have similar across the board slides leads us to believe this poll is an outlier and -- much like the Siena poll three days before the November election -- doesn’t reflect the sentiment of New Yorkers.